Atacama Equinox AVI review | What Hi-Fi? To say Atacama's Equinox has some pedigree in the world of racks would be like saying James Bond gets lucky with a lady occasionally. Both hi-fi and AV versions are Award winners, so we had high expectations for the latest addition. 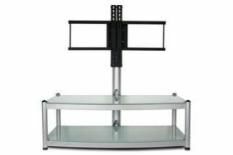 In fact, we merely wanted to confirm our high expectations, as this is the same rack as the Equinox AV, though with the added inclusion of an integrated TV mount, capable of holding a screen up to 44in in size. Build quality and design are up to standard with the universal mount, and the ability to turn your screen up to 80 degrees either way once mounted is a clever touch. As well as the neat features and smart appearance, the Equinox AVI does the task of providing a stable base from which a detailed, dynamic sound can be produced. Similarly, pictures are vivid and immersive, with no sign of any faults introduced. All told, this AVI is a winning addition to Atacama's Equinox range, which looks to have the competition well and truly – ahem! – on the rack.